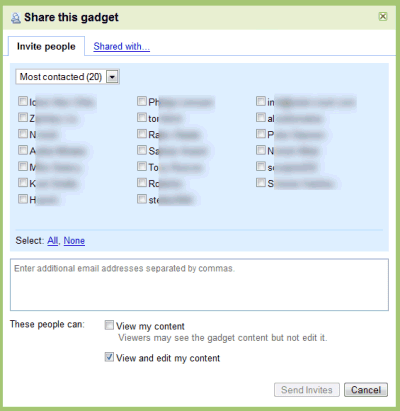 iGoogle added a new feature that lets you share gadgets with your contacts and allow them to edit the content from your gadgets. For example, if you share the To-Do list gadget with your friends or co-workers, they'll receive an invitation to add the gadget to their iGoogle pages and every time someone makes a change it will be propagated to all the instances of your shared gadget. For now, the list of collaborative gadgets includes: to-do lists, notebooks, crossword puzzles, birthday reminders, but we'll see more interesting ideas as gadget developers can easily add this new feature. "It's now possible for multiple instances of a gadget - on the home pages of different users - to access the same user-preference data, the part of the gadget state that is hosted by iGoogle. (...) It's a simple sharing model - last write wins, and a reload is required to see changes made by others." Or I did not understand something : It is a collaborative tool or not? After use Netvibes, it's imposible to use Google/IG. Netvibes it's a lot more usable. I've tried to use this collaborate tools, but it's too ugly. It doesn't seem to work on my Google Apps page which seems a natural place for this since apps are pretty much for teams. Oh well.